Taiye Selasi on the TED stage. When I say the word identity, what does that word mean to you? TAIYE SELASI: I mean, I suppose it should mean a great deal to me since I spent so much time thinking and writing about it. SELASI: But I suppose the reason I've spent all that time thinking and writing about it is because it's never meant very much to me at all. RAZ: This is author Taiye Selasi. SELASI: So my sort of identity is a multiple choice of identities available to me. You've got passport color. You've got where your parents were born. You've got where you were born. What does that mean? Is that my identity? Is it just this plus this plus this plus this plus this? Because once you've added all that up, what do you have? RAZ: And Taiye's always been kind of bothered by the way we identify ourselves, the questions we're supposed to ask, the answers we're expected to give and how that picture doesn't necessarily match the person. And it's something she had to confront a few years ago when she went on her first book tour. 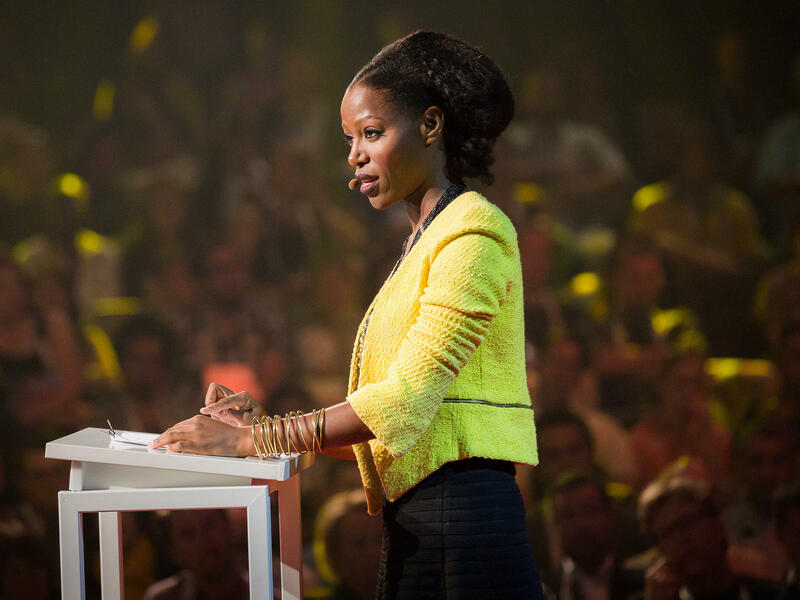 Taiye Selasi picks up the story from the TED stage. SELASI: Every talk in every country began with an introduction. And every introduction began with a lie. Taiye Selasi comes from Ghana and Nigeria or Taiye Selasi comes from England and the States. Whenever I heard this opening sentence, no matter the country that concluded it, I thought, but that's not true. Yes, I was born in England and grew up in the United States. My mum, born in England and raised in Nigeria, currently lives in Ghana. My father was born in Gold Coast - a British colony - raised in Ghana and has lived for over 30 years in the kingdom of Saudi Arabia. For this reason, my introducers also called me multinational. But Nike is multinational, I thought. I'm a human being. Then one fine day, mid-tour, suddenly it hit me. I'm not multinational. I'm not a national at all. How could I come from a nation? How can a human being come from a concept? It's a question that had been bothering me for going on two decades. To say that I came from a country suggested that the country was an absolute, some fixed point in place and time - a constant thing. But was it? In my lifetime, countries had disappeared, Czechoslovakia appeared, Timor-Leste failed, Somalia. My parents came from countries that didn't exist when they were born. To me, a country - this thing that could be born, die, expand, contract - hardly seemed the basis for understanding a human being. History was real. Cultures were real. But countries were invented. RAZ: I mean, you must get that question all the time. Like, where are you from? And presumably, you cringe every time you get that question. SELASI: (Laughter) Well, you know, it's funny, Guy. When I was growing up in the 1980s, the version of that question, where are you from, most commonly posed to me was what are you, which is actually the more jarring formulation. SELASI: You know, what are you? (Laughter) Well, I'm not an alien. What am I meant to reply? Until I began to question the question back - if you see what I mean - and that happened only in my late 20s. I was really burdened by the interrogation. I really was, Guy. And I think that's because I always felt in some self-conscious way that I didn't know. It was really troubling to be asked that question, I think, every day of my life, thousands upon thousands of times. And I think I used to feel embarrassed. I used to feel exposed or somehow caught out. I used to feel the other people who could answer that question very simply and very quickly were in a position of power relative to me because they had a home, and a home is a helpful thing, and I did not - is how I felt about it. But I came to a moment where I thought, well, no, you don't have a home, Taiye. I just had to confront it, get over it and ask myself, what kind of being, what kind of becoming, what kind of human experience lies on the other side? And that's what changed how I feel about the question. SELASI: All experience is local. All identity is experience. I'm not a national. I'm a local. I'm multilocal. See; I have no relationship with the United States, all 50 of them - not really. My relationship is with Brookline - the town where I grew up - with New York City, where I started work, with Lawrenceville, where I spend Thanksgiving. What makes America home for me is not my passport or accent but these very particular experiences. Despite my pride in Ewe culture, the Black Stars and my love of Ghanaian food, I've never had a relationship with the Republic of Ghana writ large. My relationship is with Accra, where my mother lives, where I go each year. These are the places that shaped my experience. My experience is where I'm from. What if we asked, instead of - where are you from? - where are you a local? The difference isn't the specificity of the answer. It's the intention of the question. All of those introductions on tour began with reference to nation as if knowing what country I came from would tell my audience who I was. What are we really thinking, though, when we ask where someone comes from? And what are we really seeing when we hear an answer? Here's one possibility. Basically, countries represent power. Where are you from? Mexico, Poland, Bangladesh - less power. America, Germany, Japan - more power. RAZ: You know, you mentioned the connection between power and identity when we say, I'm from this country or from that country, but what about, you know, your place inside that country and the discomfort with some of the power that may come with that? So, for example, like, in the U.S., there's a growing awareness of privilege and power and even the concept of whiteness, which, you know, is very challenging for - I'll just talk about me. I'm a white man, or that's how I'm perceived. I recognize the conversation around privilege and want to be part of that conversation, but a big part of me is - sort of has trouble with the knowledge that I've benefited from that, you know, knowing how unfair that is. SELASI: Absolutely, absolutely. And it's all contextual. I mean, power and its exercise - these are shades. These are graded things, you know? Just a middle-class brown girl lives in a completely different space in many places than a middle-class brown boy, to speak nothing of a working-class or an immigrant or a refugee or an unemployed brown person. I mean, these layers have to be contended with, and for some of us, the contending is more exhausting. It's more demeaning. SELASI: And so I would say, you are privileged. You have been given a power that you probably would not ask for, but you have it. And it is not a locked box. You can add nuance to that, add grace to that, move around in that space and think about how to be responsible about the exercise of that power, which is different than being assigned an identity that renders you powerless, where, of course, you will find your voice, of course, you can find your power, but where the struggle is mighty and daily and exhausting. RAZ: You know, you talked about the many different identities that we inhabit. And so if someone, you know, were to ask me, who is Taiye Selasi? - I would say, well, she's a writer and intellectual; she's lived all around the world. Would that be right? SELASI: Yes, but not complete. I think most of us want to access as much of ourselves as possible. And so I would be happy to be called a writer. In fact, that's the primary identity by which I know myself. Yes, an intellectual - I'll take that. But, of course, I'm also a twin, the daughter of a very proud Yoruba woman. That comes with some things. And then that woman has lived for close to two decades in Ghana, which is where my father's from. So my sense of self is hugely rooted in parts of West Africa, hence sort of my writing on this experience. And then blackness - an identity that was given to me (laughter) with no option of return by the United States of America - has also become part of my consciousness in a way that is not true for all West Africans. And so I'm trying to say - who is Taiye? - there are so many answers, and I'm happier the more answers there are. I would never want there to be just one. RAZ: Taiye Selasi is the author of the novel "Ghana Must Go." You can check out her entire talk at ted.com. On the show today, The Person You Become. Stay with us. I'm Guy Raz, and you're listening to the TED Radio Hour from NPR. Transcript provided by NPR, Copyright NPR.